Dr. Harvey Doak Wood was born on January 8, 1847 on a farm near the Middle Fork of the White River, now part of Elkins, Arkansas. He died at the age of 91 on May 13, 1938, the death precipitated by a fractured hip. As a child he attended a small nearby log schoolhouse just prior to and after the Civil War (there was no school during these years). Known as Doak, he read medicine with Dr. B. F. Williams in the nearby community of Maguire and used its store as a study location. In 1869 he enrolled at St. Louis Medical College. To support his education he taught school, thus slowing his progress through the two-year school. In 1872 he graduated as a M.D. and began his practice at the Maguire Store, later moving to Farmington and then to Fayetteville in 1874. His last office was over Duke’s Jewelry store on the Fayetteville Square. In 1871 he married Annette Dickerson. The couple had three boys and 2 girls, one of which was an adopted niece. For many years the family lived on Washington Street in Fayetteville. Annette preceded him in death by 18 years. His mother, Katie lived with the family in later years. When noise bothered her, as a loving son, he stopped the finishing work on his house until she died in 1884. 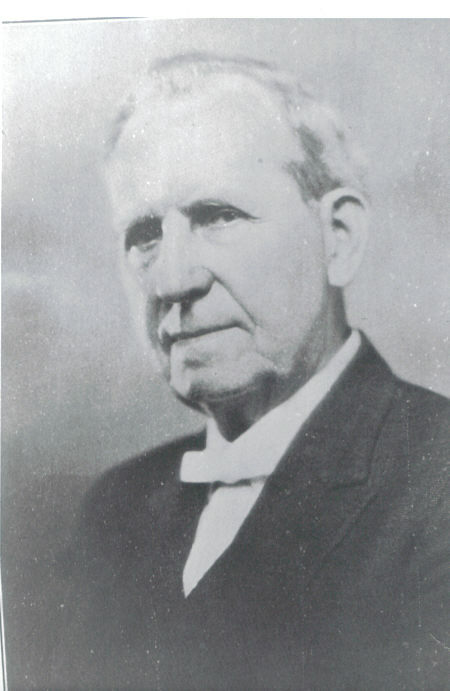 Some of the notable characteristics and accomplishments of Dr. Wood were: his immaculate appearance and white bow tie; his exacting speech and haste to correct younger men of mispronunciation; the hobby of coining medical words and sending them to Dorland’s Medical Dictionary—many were accepted; his continued study and attendance of medicine lectures; the often firm and ready advice never to smoke or consume alcohol; the purchase of one of the first Model T Fords in Fayetteville and his habit of never getting out of second gear; a special interest in appliances for fractured limbs (he designed a retractor and modified the Hodgens splint); the design of an instrument to measure the pelvis of a woman whose difficult delivery he anticipated; and the bending of forceps to fit an angle needed in treatment. Professionally he tutored a young man aspiring to become a doctor, the later well-known Dr. Andrew Gregg. In 1913 he established the Washington County Health Department. He was an active civic force in the drive to construct Fayetteville’s first hospital (built in 1912). Always interested in the professional status of medicine, he was an original member of the Washington County Medical Society and later served as Vice President and as the 50th President of the Arkansas Medical Society. Dr. Wood considered medicine “the noblest of all professions” and practiced his beloved profession for more than 62 years. Harvey Doak Wood M.D. and his wife, Annette, are buried in Evergreen Cemetery in Fayetteville, Arkansas.